It is essential for people to understand that any forms of pain should not be disregarded since it is the body’s way of saying that something is not right. For example, toothache does not occur without any reason. It may indicate sensitivity, a formation of cavity, infection, and more. Since there is no effective way of telling the exact cause of discomfort without the help of a professional, taking just any medication is not advised. Although over the counter medications can manage pain, its effects will fade after a few hours. It is not advised to perform this practice since it can have severe consequences in the long run. The best way to deal with oral pain is by addressing the issue to a dental professional. We at Riverheart Family Dentistry encourage our patients who experience oral pain and discomfort to seek dental attention immediately. Our practice can make oral health care assistance possible any time by offering Emergency Dentistry services. However, it is essential for patients to know that despite the availability of this service, they still play a part in securing the state of their oral health. Ignoring dental pain is a no-no since doing so can keep a person from sleeping or eating properly. Tooth pain can be due to the formation of a cavity or gum disease, but a patient cannot be so sure. Taking medications can temporarily help, but a dental visit should be scheduled immediately to prevent the condition from worsening. Inflammation takes place due to the reaction of the immune system to an allergy or infection. If swelling takes place in the mouth, jaw, or face area, seek professional assistance immediately. This emergency usually takes place due to an accident or trauma. Retrieving the tooth would be ideal since there is still a chance for the dentist to insert the tooth back to its socket. However, to make this possible, avoid scrubbing the tooth, holding it by the roots, and letting it go dry. Make sure to soak it in a glass of milk or water while going to the dental office. If this takes place while brushing or flossing, it is due to gum inflammation (gingivitis). 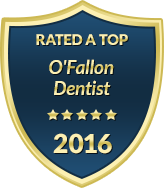 The best course of action is to observe proper hygiene practices and undergoing professional cleanings at the dentist. However, it is a different story if the patient happened to bite their soft tissues like the cheek, tongue, or lips. If excessive bleeding is experienced, use a cold compress and rinse the mouth with a solution of salt & warm water. Try to apply pressure on the site, but if bleeding persists, see the dentist immediately. For more tips and information about the most common dental emergencies, call or visit us at Riverheart Family Dentistry! If you experience one yourself, do not hesitate to take advantage of our Emergency Dentistry service in O'Fallon, MO!